President Muhammadu Buhari has said that he greatly appreciates Goodluck Jonathan, the former president, for accepting the defeat in 2015. 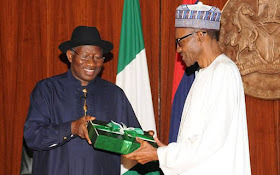 Buhari said that Jonathan will always be in his thoughts for this unique action. Buhari said this while also disapproving of the activities of religious extremists calling "Allahu Akbar (Allah is great)", killing innocent people. The President also stated that the activities of the Boko Haram sect in the northern part of the country would soon become history. Buhari spoke on Thursday night when he hosted members of the entertainment industry of Kannywood in the presidential villa in Abuja. Buhari said, "It is completely wrong for any believer in God to kill innocent people in either the mosque, the church, or the marketplace. "You can not call Allahu Akbar (Allah is great), Allahu Akbar, and kill innocent citizens and destroy everything, all in the name of God. "Either you do not know what you are saying or you do not even believe in the existence of God the Almighty God has nothing to do with injustice. "Well, now we confront them and by the grace of God we will destroy them." Commenting on Jonathan, "I will continue to honor former President Jonathan as a result of this unique act.